Many of us start our businesses out of passion, not always entirely sure that there is a market for what we create and sell. Facebook ads is an excellent way to find out if there is a paying customer out there for your product. Plus it can give you so much more data that you can use to improve your business. Finding the right audience for your offer isn’t always as easy as everyone makes it out to be. Whilst you may already know some details such as their age, geographic location, and some demographic data, the rest might still be unknown to you. What other pages does my audience like/follow? What key interests do they have? What other things do I know about them (employer, habits, marital status, kids)? There is a lot of information available on Facebook, but if you’re unsure where to start I suggest Audience Insights or use Facebook’s Suggestion feature to find additional recommendations. It’s important to differentiate what you’re looking for in your audience. For instance, to find yogis on Facebook, type “yoga” in the Detailed Targeting field. You’ll see a variety of choices, such as people who are interested in yoga, work as yoga instructors, or are studying yoga. You’ll also find specific yoga interests through further searches. You may want to further refine your audience pool with the Narrow Audience feature. 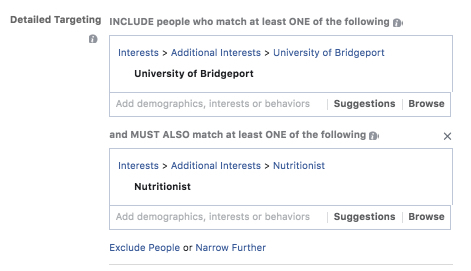 Say you are interested in Nutritionists from a specific school. In the top category, you can list the institution. Then click Narrow Further and specify that you’re looking for an interest in nutrition. To start testing your campaign, create individual ad sets for each of the audience groups. If you have the time and budget, you can create one ad set per interest/behavior/demographic. Remember what your overall objective was at the start of your campaign as this is the metric you’ll need to use to determine whether you are getting results for each of your audience groups. For example, if you selected people interested in Kundalini yoga and your objective was to get someone to register for a webinar, you need to look at the number of conversions inside this audience group. You’ll also want to look at the number of clicks to your landing page for the webinar to determine whether your landing page has a good conversion rate. In addition, you’ll want to keep an eye on the cost per conversion. Whilst there are benchmarks for what this number should approximately be, it is up to you what you are willing to pay for a lead. Split testing, in a nutshell, means that you test one variable by using two different options. For example, you can test which image resonates with your audience by using two or more images in your ad, or you can test your copy by using two different copy options in your ad. The main point is to only ever test one variable at a time, so you either test your images, or your copy, or your landing page etc. Now that you’ve tested your audience and done some split testing, you might want to find out if your audiences are willing to, and capable of, spending money on your product. I have to mention that this is a way of testing your sales potential but there are a lot of other factors that play a part in selling your product, so please don’t use this as the only measure. If you don’t already have one, I suggest that you come up with a lower-cost offer. Selling a high-priced item will take longer and require additional warm-up steps, because people may not be ready to buy even after they’ve seen some of your work. To start testing your conversion, create a new Facebook campaign with the Conversions objective and select the action you want your audience to perform. I usually select ‘purchase’. To measure if you’re getting results you’ll need to first install the corresponding pixel, so if you have selected ‘purchase’ you’ll need to install this pixel on your thank you page. For your audience, you want to select audiences that have seen your messages before. I don’t recommend using cold audiences to sell your products as they will most likely disappoint you. Setup custom audiences of people who have engaged with your page before, have visited your website, are on your mailing list or have watched your videos. Pay attention to the cost per purchase, and if you can keep your cost lower than the price of your product, it’s an early indication of success. If you’re not seeing any conversions at this stage or the price of the conversion is too high, check the other elements of your ads. There are a number of elements that determine the success of your ad. 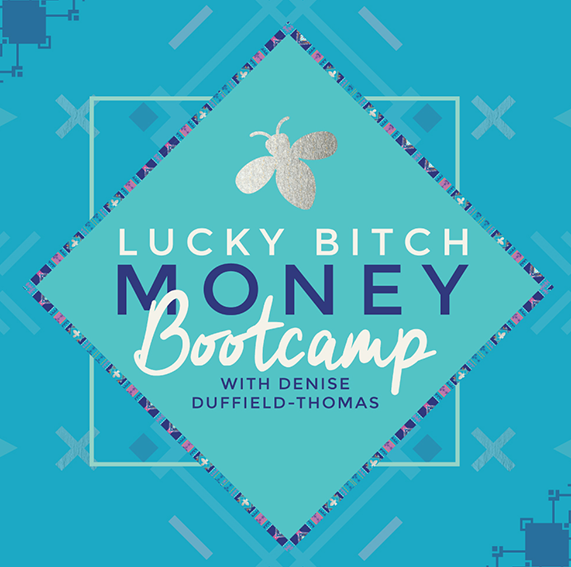 (Check out my free video training: the 5 Must Have Elements for Running Successful Facebook Ads). Facebook is the perfect platform to test your marketing, it gives you a lot of data that you can use to inform your messaging, branding, landing pages, you offer etc. 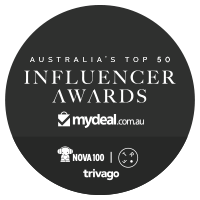 Use it to test your new products and offers before investing too much time and money into it. Once you find the right combination of audience, message, and offer, you can use Facebook to continue marketing your product by replicating winning ad campaigns. A little note, Facebook ads continuously changes so what worked for you this time may not work for you in a few months. It’s all about continuously testing what does and doesn’t work and then optimise and scale what is giving you results.